For the young guns who misfired last year, Morecambe’s Globe Arena could be the final staging point of their Newcastle careers. It is a stark message – and Alan Pardew draws back from saying it is their “last chance” – but United’s crop of youthful fringe players have effectively been put on notice as they carry Newcastle’s Capital One Cup hopes on their shoulders tonight. Left-back Paul Dummett, winger Sammy Ameobi, forward Haris Vuckic and midfielder Gael Bigirimana will all start against League Two opposition. Having survived a cull which has seen Shane Ferguson and James Tavernier loaned out, the pressure is on them to illustrate that they can have an impact on the first-team squad after their mixed experiences last season. It is an important night from that perspective, and an intriguing footnote to the tragi-comedy of Joe Kinnear’s fluffed efforts to recruit and Yohan Cabaye’s self-imposed strike. Pardew says: “I do feel if you carry a squad of 22 or 23 professional players and you don’t use eight of them, that’s wrong. “We have paid something in the region of of £15million to £16m on young players at this club and they really need to come to the fore now. “I feel, last year, they didn’t do themselves justice in the Premier League when they played and in the cup competitions. That’s not good enough. Chief among the players who Pardew wants to see impose themselves on the game is Sammy Ameobi, who entered the fray to great fanfare in 2011 but failed to maintain that momentum last season. Ameobi clearly has plenty of ability – Youtube the breathtaking goal he scored in a charity kickabout in New York over the summer to see evidence of that. But there was something holding him back when he was given opportunities during Newcastle’s bleak mid-winter. 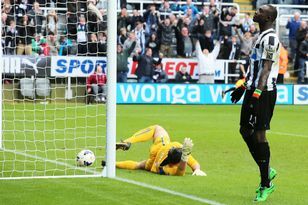 Call it mentality, call it confidence or even the lack of conviction of his team-mates, but Ameobi’s impact was minimal. He performed better at Middlesbrough on loan but now is his chance to prove what he can do for Newcastle. Pardew confirmed: “Sammy will play tomorrow and it’s a big game for him. There’s no point being a bit part player, coming in and out. “He needs to prove he can be a first-team player so therefore he’s got to come to the fore. “I want Sammy to put in a performance on Tuesday night that makes me think what should I do on Saturday. I don’t want players at this football club who aren’t going to contribute on the pitch. “I don’t want players who aren’t good enough to carry the shirt. “As a professional coach, he looks in better shape to playing week in, week out. Sometimes you need to go in and come out, go in and come out to get what it’s all about. He’s done that and now he’s not doing that any more. This is his time. Ameobi himself told The Journal earlier in the summer that he felt he was supping in the last chance saloon. It was a full and frank admission that he had not done enough to guarantee his future as a Premier League footballer – but Pardew said those sentiments had not come from him. “No no, I’d never do that to a player, it’s not fair. I’m just getting Sammy to focus on his work on player and he’s doing that,” he said. “His intelligence and his concentration are improving. It’s okay doing it here, you’ve got to do it on the day. It was a useful little cameo the other day when he came on, but he’s got to do it in a full a game and he’s got to produce.” Pardew was asked whether he felt that some of United’s younger players felt they had made it simply by pulling on a black and white shirt. He said: “That’s an interesting point. Paul Dummett said after the City game that he was delighted to come on, despite the result. “That he was made up and so on. That’s fine for one game. He’s allowed to say that once, but not the second game. He’s going to play at Morecambe as well. There is always an element of risk picking so many fringe players but Pardew does not feel it is a major gamble. “I expect to win with the team I put it out, trust me. I wouldn’t pick it otherwise, but these young players have to come to the fore,” he said.